Because of the current economic recession, motorcycle ridership is up. Unlike cars and even larger vehicles, motorcycles get 50 miles – or more – to the gallon of gas. Meanwhile, with the price of gas hovering around $4.29 in parts of Illinois (and higher in Chicago and some suburban areas!) people are looking for ways to save money on the road. Riding gives me a peaceful moment plus enough adrenaline to deal with the unpredictable. Riding is an essential part of my life; it gives me a sense of power and freedom. Riding puts life in perspective. On those days when life makes no sense, it all suddenly becomes crystal clear when I start up my Harley. I'm 60 and look forward to riding everyday. The focus it takes to ride safely takes all my problems away. Why do I ride? Ask any dog why he sticks his nose out the window. Motorcycles are no longer the preserve of men only. The Associated Press reported this year that women now account for more than one-fourth of the 27 million motorcycle riders in the United States. 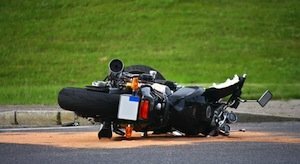 Trouble is, motorcyclists are far more vulnerable to serious accidents given the nature of a motorcycle’s construction. Yes, motorcyclists can wear protective clothing, including gloves, leather pants and coats, plus a helmet. Motorcycle drivers are urged to “drive defensively” and always be on the lookout for motorists who are not looking out for motorcycles. Nevertheless, a car-motorcycle accident will have serious repercussions for the motorcycle driver. According to the Illinois Department of Transportation (IDOT), 131 people were killed in 2010 in crashes involving motorcycles (motorcycles, motor scooters, motorbikes, mopeds, etc.). The 131 motorcyclists who died account for over 14 percent of all motor vehicle fatalities that occurred that year. Meanwhile, motorcycle registrations comprised only 3-4% of all motor vehicle registrations. So it’s obvious that motorcycles are over-represented in fatal accidents in Illinois. No doubt about it, driving a motorcycle is dangerous! And the 131 motorcyclists killed in 2010 represent a 27% increase compared to the 103 motorcyclists killed in 1999. According to IDOT, the average age of all motorcycle rider fatalities in 2010 was 42. Of the131 motorcyclists killed, 118 (90%) were male, the department reported. While many of us might imagine riding a motorcycle down a deserted country road, the largest number of motorcycle fatalities in Illinois take place on the crowded streets and highways of Chicago and surrounding areas of Cook County. In 2010, 30 of the fatal accidents involving motorcycles occurred in Cook County, while five occurred in the less-populated Will County. Other counties in the state reported only one or no motorcycle accidents at all during 2010. When do most motorcycle accidents take place in Illinois? In the summer months, of course, when ridership is up. In fact, 40 percent of the fatal crashes in Illinois in 2010 occurred in July and August. And – this is interesting – more serious accidents take place during the weekends rather than week days, according to IDOT. Failure to keep in the proper lane. Operating the vehicle in erratic, reckless, or negligent manner. Failure to obey actual traffic signs/control devices/officers. Failure to obey safety zone traffic laws. Kreisman Law Offices has handled motorcycle accidents for individuals in the Chicago area and in Illinois for more than 40 years. Robert Kreisman recently handled the case of a young father of four from the Chicago area who was killed while riding his motorcycle on an expressway. An automobile driver had swerved across several highway lanes so as not to miss his exit. The motorcyclist had no chance to avoid colliding with the car. His helmet did little to save him. Kreisman Law Offices obtained the full insurance policy limits for the decedent’s family.